Erik Solheim, Director of the United Nations Environment Programme (UNEP), has resigned. See reports from the Guardian and the BBC. 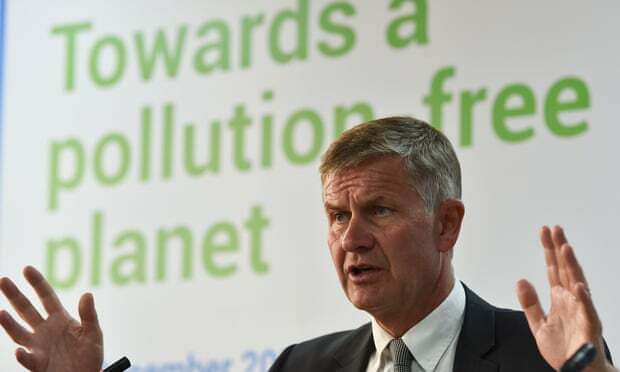 Despite standing on a platform calling for a pollution-free planet (see image above), climate hypocrite Solheim led a jet-setting lifestyle, spending almost half a million dollars on air travel and hotels in just two years. Full details are apparently in an internal UN report that has not yet been made public. Without carbon pollution, Earth’s atmosphere would be incompatible with life. Zero ppm is literally a planetocidal target. Good riddance to Holocaust-fantasizing thanatocrats. Have these ‘conservationists’ ever conserved anything worth mentioning? Well Al Gore sets a high bar for hypocritical self serving deception. I wonder if Lew has an explanation for this type of behaviour? UNEP’s Nairobi-based Ozone Secretariat should be next. In 2016 its 17 employees were responsible for emitting an average of 28 tonnes of CO2 while flying on Secretariat business. At 250 g of CO2 per passenger km, that would be 114,000 km each, or 2.8 circuits of the Earth (or, for traditionalists, the length of 9.5 million double-decker buses). She was there to talk about fridges. Her fridge in Nairobi had got too hot and stopped working properly and, seeing as Quito, like Nairobi, is on the equator, she thought she’d fly over and ask Lenin for help. He told her that she should leave it unplugged for a day or two to let any ice melt and also check the fuse. No, OK, she was in Quito for MOP 30, the Thirtieth Meeting of the Parties to the Montreal Protocol. As far as I can tell from the minutes, people flew to MOP 30 from all over the world solely to agree on a budget for future meetings of a similar nature. Whereas the life of a sceptic can be quite low in CO2 production. Last time I looked closely at it I came to the conclusion that I was roughly CO2 neutral. Since then I have bought a new car which would involve some embedded CO2, and also took my first flight for 4 years recently, so I guess i’ve Slipped. Day to day though, I grow more trees by far than I burn for heat, export more power to the grid than I import from it (economic for me but not so much for my fellows on the grid) and my few cows methane production is also offset largely by tree growth and pasture management which should be increasing soil carbon though the last point seems to have very variable outcomes when studies are done. The cows water falls on the land where they live- some people might claim I should be letting that flow to where it can be used more profitably for a higher value crop- but I’m damned if I quite see why I shouldn’t use it myself.Some of my income however comes from the activities of public companies involved in various activities. Not quite sure if I should be pinged for their CO2 or whether that is down to their customers. I eat meat every day and sleep with a clear conscience due to the low travel miles as they walk to the yard where I sh**t them. Many of the vegetables only have a few metres of travel too. How insufferably smug I am. And all at the expense of the long-suffering taxpayer. He met with many Heads of State, AGW luminaries such as Sir Crispin Tickell, Professor Stephen Schneider, Lord Stern, Professor John Schellnhuber, Ban Ki Moon, Kofi Annan and Prince Charles amongst others. He attended presentations and honorary degree ceremonies and his book launch. He liked to attend Clinton Global Initiative meetings, Rockefeller Foundation and Brookings Institute events. “Figueres is by now a familiar face at UMass Boston. She first visited in 2013 as the speaker at the annual Slomoff Lecture, then delivered the commencement address at UMass Boston’s 46th annual ceremony in May 2014.” Her mother lives in Boston. “The 24th Conference of the Parties to the United Nations Framework Convention on Climate Change, COP24 will be held in Katowice December 2 – 14 December. The key objective of the meeting is to adopt the implementation guidelines of the Paris Climate Change Agreement. “Abstract: The attempt to develop international cap and trade markets for anthropogenic greenhouse gas emissions, ultimately aiming to determine a global price for carbon, is the most extensive attempt ever made to use market-mimicking mechanisms to deal with an environmental externality. What’s a few bob on fancy excursions when set against this vision. Reading this report, and the rationalizations of the climatocracy, reminds one of “Always Lent, never Easter”. The life of a sceptic can be low in CO2 production but it can also be stratospheric. Last time I looked at it I came to the conclusion that I was roughly producing the CO2 of a small herd of wildebeest. Since then I’ve probably slipped, driving considerably less and using free public buses. Day to day though, I import all my gas and electricity. My garden grows nothing but grass, flowers and shrubbery that require copious amounts of fertiliser and hosepipe water (especially during summer droughts). I am retired, so I produce nothing, but in the past I contributed to the finding of oil and gas, and latterly to the contamination of young minds – turning them away from the true path of climate activism. I eat meat every day and out of season vegetables and fruit that stack up huge travel mileage, but still sleep with a clear conscience due to my promoting international trade. How insufferably smug I am as well. Pingback: Head of UN Environment Program Resigns | Watts Up With That? More on guilt trips. Good one, Alan. Here, we let huge lace monitors and eastern water dragons breathe as they wish. Should I bash my head on a rock therefore? Oh, wait, that would release carbon. I do find plastic see-through peanut butter jars, storing nuts and washers for decades, are better than glass jars, as those can drop and smash. Also, nylon tow ropes are better than manilla ones. Is your laptop bamboo? Etc. Going to paper instead of plastic bags takes down ever more forests, cleared for fibre plantations. As Fry pointed out, goodbye the last lemurs, on Madagascar, swopped for guiilt-free paper bags for halfwits. Conferences should be on the net. Jet-setting by greenies is utter hypocrisy. And for tourism, get a camera and film what is closest. See RescueRavenswood on Facebook for our version. Denise does hers mostly sitting in her chair on the verandah. The driver of climate change is geomagnetics. So, to stop it, we go joust with the devil at the core-mantle boundary each with a wooden spoon?